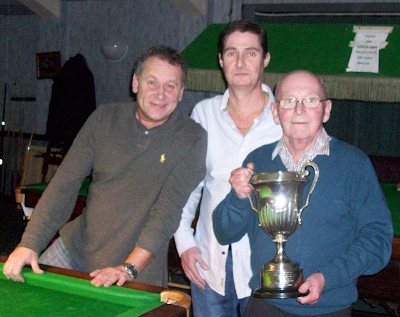 Wednesday 18th December was the chosen date for the semi-final and finals of the Club's 2013 Christmas Snooker Handicap competition. Unlike the previous rounds matches are a best-of-three frame challenge. 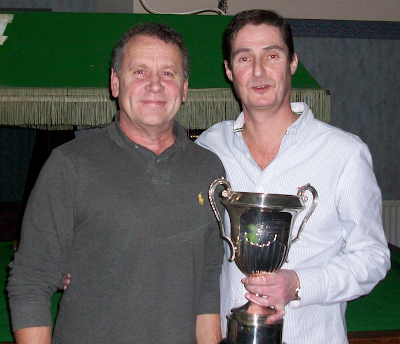 This year the semi-final pairs were John Higgins and Dave Wilkinson plus Mike Sullivan and Ralph Roberson. In the opening round previous winners, and bookies favourites, John and Mike won out to meet in the final. A match that was expected to be a tightly fought spectacle. While Mike eventually emerged the victor of the first final frame, John's form returned in the second to level the match. Tension levels soared, for players and audience alike, as Mike and John began the deciding frame. Play was noticeably cautious, each trying not to let the other establish a winning break. In fact some spectators noticed a distinct similarity with the classic televised snooker duels of yesteryear featuring Cliff Thorburn and Terry Griffiths. In the end it went right down the black ball, which John sank to take the trophy. So it's congratulations to John and commiserations to Mike, who can of course try again in this year's event. Thanks go to Kevin Shackleton for organising the event, all those who took part in the handicap, the evening's audience and Mark Anderson for supplying the pies.